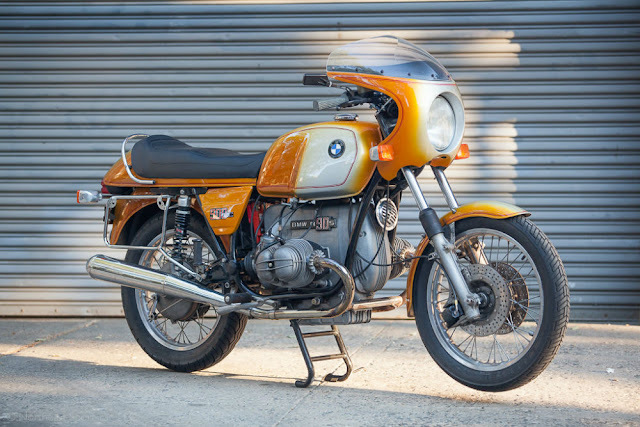 BMW's 'Boxer' motor has been a motorcycling stalwart for decades - and shows no signs of stopping! It was dubbed the Boxer because of the way the flat-twin's pistons 'punch' their way in and out ... or, 'reciprocate', for the technically-minded. The set-up provided surprisingly swift progress ... given that it is not a layout famed for its sophistication! But, hey, if it works, keep it simple! Okay, so the R90S may have been a tad behind its rivals in terms of all-out power. But it more than made up the deficit with its styling. A neat bikini fairing topped off smoked orange paint. BMW bikes - and their riders - have long enjoyed a 'unique' position within the biking fraternity. A BMW is the machine of choice for the respectable, law-abiding biker. Well-heeled - and without the hell-raising - you might say! In its blending of calm solidity, and Teutonic good looks, the BMW R90S can be considered a design classic.